The Bold and Underlined ones are My Selected Top 10. One Analysis shows that 9 out of 10 are either by RGV or more recently Anurag Kashyap. Only exception is Imtiaz Ali for Rockstar and Rakeysh Omprakash Mehra for Rang De Basanti. 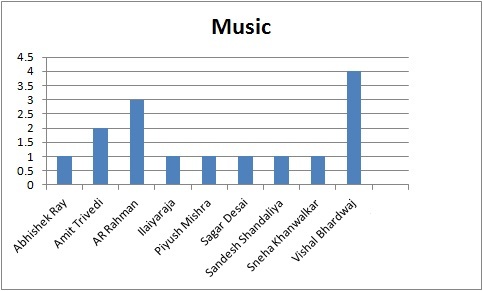 While Vishal Bhardwaj and AR Rahman stood out among many good Music directors. Special mention to new music director Sneha Khanwalker for some amazing music in Gangs of Wasseypur I and II. 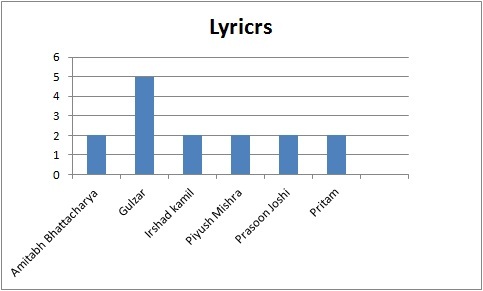 Not to forget Amit Trivedi who has given some good songs including Udaan(not in the list, just missed the Top 50 slot) and Dev D.
While Gulzar leads the lyrics department , and quite amazingly he does well with both Vishal Bhardwaj and AR Rahman.